Odessa, Ukraine - Nektony today is pleased to announces release and immediate availability of Informer 1.0, its next application from their iPhone/iPad product line. Informer supplies users with clear information regarding processes currently running on his/her mobile iDevice. 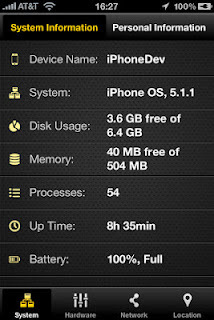 Informer monitors and displays the basic IPhone/IPad parameters, including disk and network information, RAM status and system configuration. For many iOS devices owners, it is important to know how certain apps affect the performance and especially memory constraints of the device's entire system. Informer helps to avoid app crashes and freezes, and helps to keep under control the memory-hungry apps. It is useful for owners of mobile devices in everyday use and will be especially helpful for those who are thinking about upgrading their devices. 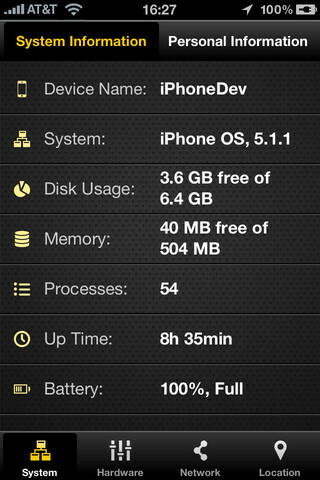 Informer provides the most comprehensive information on monitoring and analysis of iPhone/iPad performance. It displays the current parameters beginning from the most basic device status parameters disk usage, network connections and carrier information, and ending with advanced user data such planned events in the calendar. Also it indicates device's location and name of mobile operator. Informer it is a best choice for anyone who wants to see if his iPhone/iPad running correctly; and to monitor the actual information on its system and data status. Informer is the best choice for anyone who want to see if his iPhone / IPad is running correctly, and ensure the relevant information about its system and data in it. Informer 1.0 is only $0.99 USD (or equivalent amount in other currencies) and available worldwide exclusively through the App Store in the Utilities category. Nektony is a software development company with a passion for OS X and iOS products. With a commitment to release functional, stable and efficient applications for all Apple fans, the company's software development experience has the capacity to take on all projects regardless of complexity by creating products with outstanding usability. Copyright (C) 2012Nektony. All Rights Reserved. Apple, the Apple logo, iPhone, iPod, iPad and Macintosh are registered trademarks of Apple Inc. in the U.S. and/or other countries.